Mark Taylor, 1 Corinthians, New American Commentary 28 (Nashville: B&H, 2014). First Corinthians continues to draw significant commentary interest. Taylor’s work now joins the crowded field of recent efforts (since 2000) by Lockwood (Concordia 2000), Pratt (HNTC, 2000), Thiselton (NIGTC, 2000), Sampley (NIB, 2002), Garland (BECNT, 2003), N. T. Wright (Everyman, 2003), A. Johnson (IVPNTC, 2004), Naylor (2004), Keener (NCBC, 2005), Schenk (WesBC, 2006), Collins (SP, 2007), Verbrugge (EBC rev., 2007), Fitzmyer (AB, 2008), Ciampa and Rosner (Pillar, 2009), Montague (CCSS, 2011), Perkins (Paideia, 2012), and Vang (Teach the Text, 2014). Gordon Fee’s revised NICNT volume is also scheduled for 2014. 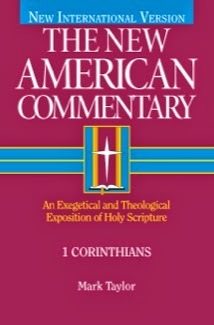 This latest volume in the New American Commentary series is a solid work. It consists of a brief 15-page introduction and a respectable commentary section of a little over 400 pages. The explanations are clear and concise, broad but not exhaustive. This is in keeping with the author’s intention to write for the “teaching pastor” and “produce an up-to-date commentary of mid-range length that interacts representatively with the most recent scholarship” (author’s preface). In many ways Taylor has achieved his stated goal. However, I believe that this work could have been more helpful to the “teaching pastor” in two ways. First, while the author does a decent job in identifying differing interpretive views, he often does not explain which view he prefers and why. Helping the teaching pastor think through the various options would have enhanced this commentary’s value. I suspect that many who want more in-depth analysis will find this commentary to be too succinct and turn elsewhere. Second, students of 1 Corinthians know that the book addresses a number of issues that continue to have relevance today (e.g., lawsuits, church discipline, the role of women in the church, speaking in tongues, etc.). But this commentary does not really explore these issues at any depth. To be fair, many commentators limit themselves to interpretive issues and do not tease out the implications or theology of the text for their readers. But since this commentary has the stated intention of helping teaching pastors then it seems reasonable to expect this kind of help. Many pastors that I know appreciate at least some help in moving from exegesis to application. Again, pastors looking for this kind of assistance will likely be forced to seek other resources. In sum, this commentary is solid but whether it does enough to find a sufficient niche within the crowded, and perhaps over saturated, field noted above remains to be seen. Much thanks to B&H Publishing for providing the free review copy utilized in this review.